Seeing action in parts of 18 NHL seasons, Brett Hull would spend 11 of those in a St Louis uniform, where he averaged better than a point-a-game throughout his time with the Blues. 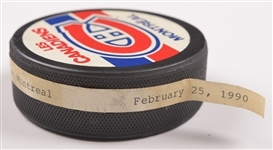 We have an important puck from Hull’s collection, with the example he used to score his 61st goal of the 1989-90 season. 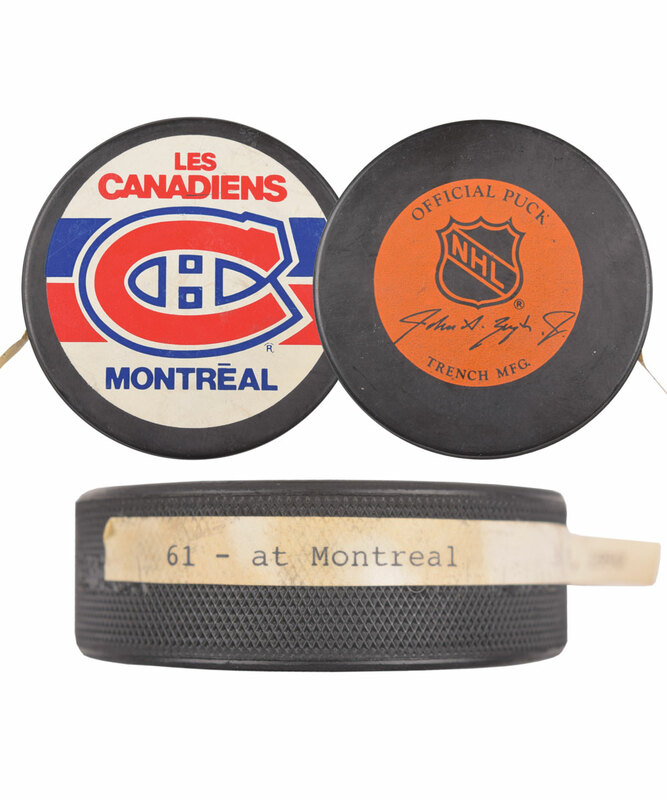 Taking place in a Feb 25th contest against Montreal at the Forum, the official Trench Canadiens puck has a thin somewhat-detached label, with typed particulars including “61 – at Montreal Feb 25, 1990”. A signed LOA from Brett Hull will accompany. The puck feature’s clean InGlasCo and Blues logos, with just light overall wear. The label along the side has become detached at one side, with some yellowing occurring due to the glue used to affix it. With 5 seasons of scoring 50 goals or more, Hull would conclude the 1989-90 campaign with 113 regular season points, including 72 goals, with his 61st scored serving as his 135th regular season career goal.